Locals in Dumfries and Galloway welcomed news of a community partnership approach in a proposed wind farm, at a series of public exhibitions held in March. Over 120 locals attended the exhibitions to find out more about the Knockendurrick Wind Farm, which were held on Monday, March 18 at Twynholm Village Hall, Tuesday, March 19 at Kirkcudbright Town Hall and Thursday, March 21 at Gatehouse of Fleet Community Centre. Feedback from the three public exhibitions held close to the proposed site reveal that members of the local community are positive towards the proposition of a community partnership scheme. Under the proposed community partnership, communities surrounding the development would secure a share of the revenues generated from the wind farm, which they could then plough into priority community projects and initiatives. A specific initiative put forward, which was warmly welcomed by attendees, was an employability and training initiative, which we hope to develop in partnership with Dumfries and Galloway Council as well as local businesses in the area. This would have the clear objective of creating new opportunities for local people to help them into employment. Suzette Harris, a resident of Gatehouse of Fleet, said: “I was really impressed with the presentation given by Banks Renewables, as compared to similar events by other developers that I have been to. It was clear, concise and informative. “The information provided and discussions held have reinforced my support for a wind farm at Knockendurrick. 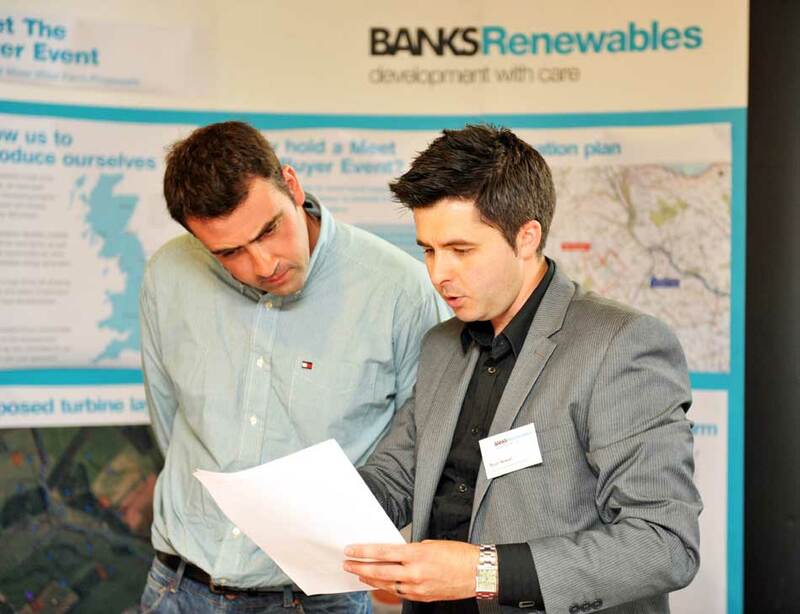 Colin Anderson, development director at Banks Renewables, said: “It was great to get some really positive feedback from local people attending the exhibitions. It has given us a real boost and we’re very excited about developing the community partnership proposal further as it seems to be of real interest to people living and working in the area. “As well as the great feedback on the community partnership proposal we also got a lot of very useful comments on the design of the scheme, which will help shape the final proposals. Our objective is always to develop a wind farm that is as acceptable to as many people as possible and which has the widest positive impact in terms of the community, environment and local economy. A scoping report was submitted in March to Dumfries and Galloway Council for the Knockendurrick Wind Farm proposals, which are for up to 10 turbines on Knockendurrick Hill. Following further design development taking account of feedback from the Council, statutory consultees and from the ongoing discussions with local people and businesses, we hope to be in the position to submit a planning application by the Autumn. Public relations in Scotland for Banks Renewables is handled by the expert PR team at Holyrood PR, providing strategic communication advice and media relations.